This is one the few syliphone titles I also happen to have. So great! Im happy to find these from net. Its so good development of sharing culture in our dark time. Thanks!!! Still I have humble hope for some more 22 Band slp`s some beautifull day. Cheers! I'll see what I can do. SLP 51, if I remember correctly. Any others? Thank you for this treasure. 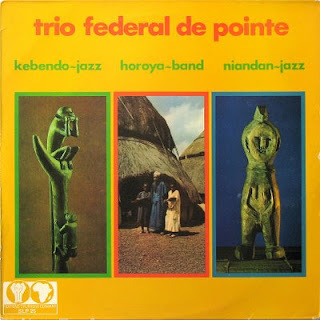 When I was in Guinea in 2008 I wanted to find out more as to why Kebendo Jazz were never made into a National Orchestra, as they won the Orchestre Moderne section in the Quinzaines Artistiques more times than Bembeya Jazz and the Horoya Band. The answer appears to be that as Bembeya were already nationalised and came from the same region - which then was called Guinee Forestiere - it was felt that having 2 National Orchestras from the same region was too biased. Such a shame. One of my favourite groups, too. Yeah, teaching the populous to read and write to a harmonious tune. Irresistable message! Haha, Sylliphone liner notes are the best! Thanks again for this one.